Line boring Services Australia offers field machining at its best, with the latest equipment & professional staff. LBSA offer a fast, reliable and timely service that will satisfy the need of the entire bore & tunnel recovery. 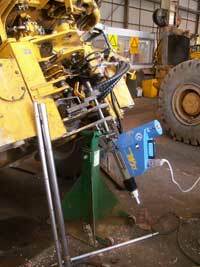 Our systems enable the operators to reclaim bores to STD sizes and to the manufacturers finish. LBSA ensures all work is free of any inferfections such as gouges or porosity which will lead to premature bearing failure and shorten the life at the pivot points. Even with the best of care machinery pin and bearing bores can wear out and become unserviceable. Especially in high load hinge points like those found on construction equipment. When a machined bore in a piece of equipment becomes worn due to high cyclic load, old age, lack of grease or some other factor, they become oval shaped or worn so they no longer function correctly. Line Boring involves rotating a cutting tool (which is located on a bar between bearings) while the piece is stationary. LBSA can provide you with superb quality boring that is always precise. When we bore your equipment, it is with the highest quality machinery that is accurate and will not leave imperfections causing you problems in the future. Since construction and mining equipment always operates around turning and pivot points, the rebuilding of pins and line boring of bushings is an on-going maintenance cost. Line Boring Services Australia LBSA has experience working on all types of Dozers, Loaders, Graders, Shovels, Draglines, Cranes & Forklifts.